For advanced periodontal care and gum contouring, Ritchie Dental Group in Marble Falls and Brady, TX relies on laser dentistry. Dental laser treatments are one of the most important evolutions of oral health to come along over the decades, offering lots of benefits for your care and making it possible for us to perform procedures like gum contouring for improved appearance and advanced gum disease treatment. A soft-tissue dental laser improves care and increases comfort. Dentistry is always growing to provide better treatment and healthier smiles. Laser dentistry is one way we offer better care. With the dental laser, our Burnet dentists can perform your gum disease treatment or gum contouring with all these benefits. 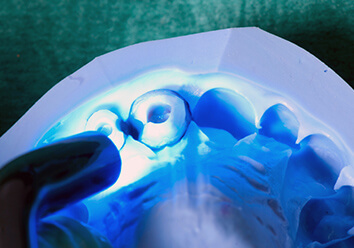 One of the most commonly performed laser dentistry treatments is gum contouring. For patients who have an uneven gum line or too much gum tissue, gum contouring is a cosmetic laser dentistry procedure where one of our dentists removes and reshapes gum tissue. Perhaps you feel that you have a “gummy” smile. If so, gum contouring with a dental laser can even out your smile and improve your self-confidence. Various factors can cause you to have an uneven gum line and require gum contouring. Genetics, health problems, or even medications can cause you to have too much gum tissue covering your teeth. Meanwhile, gum recession will cause your gums to pull back, exposing more tooth and making your teeth appear unusually long. Gum recession is often caused by gum disease or teeth grinding, and gum contouring with a dental laser can help even out the look of your gums when gum recession has caused damage. Helping patients with gum health and beauty with a dental laser treatment is just one of the ways that Ritchie Dental Group works to offer our Horseshoe Bay patients with the most recent techniques and technologies for complete general dentistry, family dentistry and cosmetic dentistry care. Improving your smile is our number one job, and we take it very seriously at our Burnet dental office. For laser dentistry, gum contouring, dental laser gum disease treatment, and other advantages of laser dentistry, contact Ritchie Dental Group if you are in the Marble Falls - Brady, TX area, including Burnet. We bring big city dental technology to Marble Falls and surrounding communities, and patients come to us from Horseshoe Bay, Burnet, Austin, and Llano for both our advanced and comfortable dental office. Make an appointment with us today!